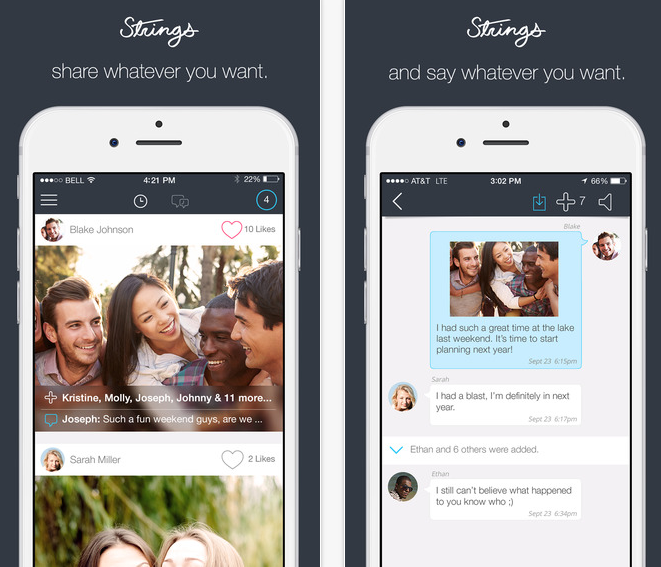 New iOS messaging app, Strings will allow its users to delete sent text messages and images permanently which they have shared with other users. Strings App will delete the message from recipients’ phones even after the recipients have opened that message. The app will require all the parties to already have the app installed on their phones. – Start conversations with only the friends selected. Add or remove people at any time. – Decide if and when content is deleted, immediately and permanently. So if you are communicating with someone using this app, then you need to worry if you have sent some wrong message to second user. Once you delete the sent text, it will be deleted from the phone of second user. Strings works with texts, emails, videos and photos. According to Strings, “We believe you deserve a way to spontaneously and fearlessly share your most intimate moments and personal thoughts from your smartphone. So we developed Strings. With Strings, you can say whatever you want, share any video or photograph you want, to whomever you want. And take it back if you want. And your friend, relative, workmate or partner cannot share it with anyone else. Unless you want them to. Strings are based on your phone number, just like texting. Only people you add as a friend can share with you on Strings. There are no privacy policies. Nothing sent by mistake that you cannot retrieve. With Strings you can message or share something to any individual or in group just like other messaging app such messenger and watsapp. But what is extra-ordinary in Strings is its variety of privacy ‘controls’. You can control who can save and download the images and videos which is sent by you from the Strings app. You can also delete a sent message or entire conversation thread. The message will be deleted permanently from the service. According to Strings, any content that a sender deletes will be removed “immediately and permanently” from the phone of the sender, recipient and the Strings servers. Strings also give its users a list of “Ten Commandments of Sharing”. The app is currently available for iPhone users and you can download the app in the iOS App Store.